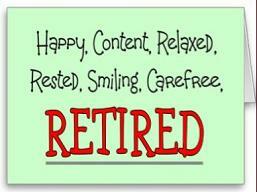 My wife retires today. She has worked in the medical field most of her adult life but today all that ends. Her employer is bringing her back for three weeks to train her replacement but it won’t be the same. Her time as a regular part of the office has come to an end. I have been invited to attend a farewell luncheon for her and I am hoping that there are some nice things said. She deserves them. She has done a great job demonstrating a blend of skill in her work and concern for the patients. She will be missed and she will miss going to work each day. On the other side, our lives are about to change. I work out of our house so I will be the one who has to adjust to having her home every day. It will be different but good. I once had a person say to me that she had reached the point where she was ready to retire from Christian service. She had done most everything that there was to do in a church and now it was time for the younger people to take over. She wanted just to do the things that she wanted to do for the rest of her life. The problem with this approach is that she saw Christian service as a job that she was called to do and from which she could step away when she reached a certain age. Christian service is an outflow from a relationship with Jesus Christ and as such it is not something from which anyone should consider retiring. Personally, I am glad that this is the case. There has been a lot of talk over the years about whether in the business world there should be mandatory retirement. When you reach a certain age, you are gone whether you want to leave or not. While there are lessons that we can and should learn from the business world, the church is not a business. One of the most serious mistakes that leaders have made over the past few decades has been to view the church as a business and to try to apply business principles to church life. It doesn’t work because a church is not nor should be a business. There are many people looking forward to the day, that my wife is experiencing today, that day when they walk out of their work place for the last time. On the other hand, my wife is having very mixed feelings. She loves the medical world and will miss it a lot. Christian service is a life style not a profession. We serve because of our relationship with Jesus and that never changes. I learned a valuable truth when I moved from being a pastor in a church to working with a mission organization. I worked for International Teams for about a decade. I held several positions within the organization. I had the opportunity to travel and to meet some amazing people from all over the world. I look back on those ten years as a gift that God gave to me and I am thankful for it. During that decade I missed being a pastor but I learned something about myself. I learned that I was not a pastor because I held that position within a church. That was just the setting in which I used my pastoral gifts. I was a pastor because I had been gifted and called to serve in that role. For those ten years I was a pastor who happened to be serving in a Christian organization other than the church. I could never get over the pastoral mindset that saw people in terms of their problems and felt a need to serve them if I could. I had many conversations with people during that decade that centered around what was happening in their lives. It is my prayer that when I am in a seniors’ home living out the last years of my life, I will still have that desire to reach out to those around me and give them pastoral care. One of the most exciting truths in scripture is found in those passages on spiritual gifts. Every Christian has been equipped with an ability to serve. There is no such thing as an insignificant part of the church. God has provided everyone with a capacity to serve. Some have a pastoral gift. Others have a mercy gift. Still others have the capacity to show hospitality. Others love to work behind the scenes doing the many things that need to be done for a church to function. There are more than twenty ways mentioned in the Bible that people can serve. One of the gifts that the Holy Spirit gives is the ability to provide leadership within a church. People with that gift need to do their best to grow that gift and use it to provide the best leadership possible. There does, however, come a time when leaders need to turn that leadership over to younger people. I once heard of a church in which the leadership team consisted of four people. Two of the leaders, although advanced in years, could still drive. They picked the other two up from the seniors’ home where they lived and they said that the meetings tended to end when one or more of the leaders fell asleep. That is not the ideal leadership structure for any church. Leaders need to know when it is time to step out of their role but stepping off the leadership team doesn’t mean that they are retired from leadership. They just need to find a new way to use the gift that God has given to them. I am looking forward to the lunch today that will honour my wife on her retirement. My one fear as she retires is that she will be busier than ever as she looks at all the possibilities for service that her new life will bring. At this point in our lives, she isn’t even thinking about retirement from serving Jesus. It will be a new adventure. Thank you Peggy and Terry! I am hoping we can get some walks in together! Happy retirement to you Gloria and blessings on future paths for you both. Great reading! I often read your posts but have not commented before. Enjoy the retirement luncheon today and will pray that that God will continue to use both of you in this next stage in your lives. Will be exciting to see what God brings to you now in this season! It was a lovely luncheon.